London Arts Academy – Whether your child is destined to be the next British child star or just enjoys the fun of going to performing arts classes. Whether they are brimming with confidence or just need that little bit extra encouragement, London Arts Academy has something for everyone. Our affiliated professional children and teen agency, specialising in Film, TV, Theatre and Commercials, are always looking for exceptional new talent to sign. #BOOM! is made up of members Tyla, Anna, Kejsi, Shem and Lily. 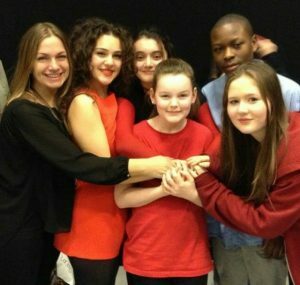 The group were mentored by London Arts Academy’s Simone Lahbib, Melanie Masson and Sheen Doran for the CBBC TV show, Sports Relief Does Glee Club. The group went on to reach the Semi-Finals. This is their dedicated Facebook page, which continues to follow the group members and their mentors, bringing you all their latest news.